Tucked away on a side street in Brooklyn’s Williamsburg neighborhood is a little theater called The Brick. Since 2002, it has been home to a wide array of experimental performance pieces, from improv comedy to puppetry to clowning. 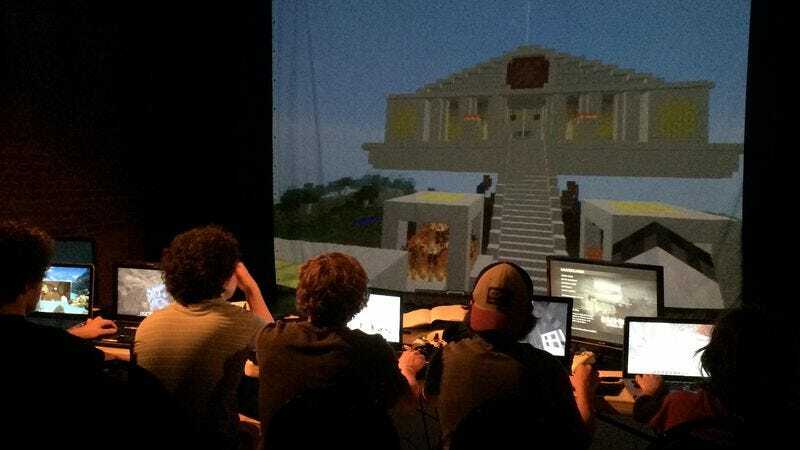 Currently, the theater is in the midst of its sixth annual Game Play Festival, a collection of about a dozen “cutting edge works that lie at the intersection of video gaming and performance,” in the words of Associate Artistic Director Gyda Arber. With little more to go on than this intriguing description, I visited The Brick for one of the festival’s performances: a show called Grand Theft Ovid, put on by the EK Theatre company, that seeks to retell classical stories using video games. I didn’t know what to expect, but I hoped the event would prove more interesting than just watching someone play computer games for an hour. On stage were seven computers set out on a table; World Of Warcraft was projected on a screen behind them. Soon, a young man sat at each station, and the performance began. By switching the projection from monitor to monitor and using different video game avatars as digital puppets, the performers enacted a handful of ancient Roman stories from Ovid’s Metamorphoses. The first piece introduced the audience to Prince Cadmus through Pokémon, and the Prince’s video game equivalent is carefree, surrounded by Pokémon-trainer friends. When his sister Europa is abducted, the action transitions to a clip of Mario being told that his princess is in another castle. When Cadmus battles a giant serpent, it’s portrayed by the gargantuan sand-dwelling snake boss from Shadow Of The Colossus. And when Cadmus and his bride turn into snakes themselves, they become a pair of serpent pets from World Of Warcraft. It’s a clever idea, for sure, but beyond the prodigious production skill on display, what’s the advantage to telling these ancient stories through video games instead of a more traditional staging? The performance answered that question with the story of Phaeton, told through the lens of the “sandbox game” Minecraft. As our young protagonist searches for his father, the Sun, he travels in a lovingly detailed world created specifically for this performance. We pass through India and Ethiopia, always looking toward the giant glowing pixel in the sky, until finally reaching our goal. Along the way, we’ve become intimately familiar with this world, so when Phaeton’s hubris subsequently sets the whole thing on fire, it’s an affecting moment. Whereas in a typical stage production we could only imagine a landscape scorched by flame, here the scope of this devastation is on full display. It heightens the calamity and makes us feel Phaeton’s shame all the more. In other words, it provides a moment of catharsis, which is precisely what classical tragedy is supposed to do. Having an entire contained universe at the disposal makes video games an effective and distinctive way to retell these myths. What’s more, both forms strike at the same archetypical themes: heroes and villains, adventure, conquest, transformation, and destruction. This means that there’s a wide array of relevant games to choose from, and by combining them with artful narration and the occasional directorial flourish, EK Theater is able to weave together coherent and impactful stories of varying tones. The company’s rendition of Narcissus and Echo is largely comedic, using the cartoonish characters from Little Big Planet 2. The story of Niobe is brutal, and EK couples it heart-wrenchingly with a scene from the shooter Halo: Reach, where the first-person perspective makes the viewer culpable in the slaughter of a woman’s family. Grand Theft Ovid implores its audience to think about both classic stories and popular games in a new way. The performance’s efficacy made the case that video games and theater are less disparate than they initially appear. Role-playing games like World Of Warcraft and Final Fantasy are essentially performance-based; the term “role-playing game” itself suggests the act of stepping into a new persona and putting on a show. Recent theatrical productions like the Macbeth-inspired Sleep No More are game-like, with audience members choosing their own path through a block of warehouses, encountering different characters and curating their own experience of the piece. But even on a more fundamental level, the two forms share in their interactivity. Theater can’t be divorced from its audience, and a play doesn’t really exist until the rapt attention of the crowd brings it to life. Drama is one of our most ancient art forms, and video games are one of the most modern. When they’re combined, an exciting alchemy occurs. The result is a far-reaching conversation between the past and future that explores our fundamental need to collectively imagine—to come together and tell each other stories. That’s not bad for an hour of watching people play computer games. Game Play 2014 continues until August 2 and runs the gamut from the traditional—an original play about a hacker, cheerleader and serial killer who meet in a chat room—to the experimental—a role-playing game where audience members race each other in imaginary carts drawn by hedgehogs. For more information, visit The Brick Theater.